As soon as you arrive in Penang you’ll notice the huge Chinese influence. 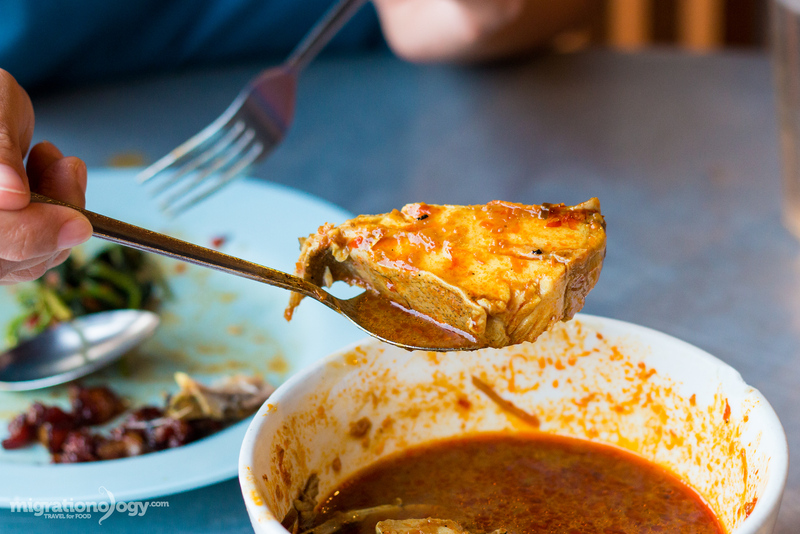 One of the best places to start exploring Chinese culture in Penang is by eating, and there’s no shortage of Chinese restaurants and street food stalls throughout the city. One of the more well known heritage Chinese restaurants in George Town is Tek Sen (德盛飯店), a restaurant established in 1965, that still gets packed out every night they open. One evening when we were in Penang, Ying and I went to Tek Sen for dinner and ate some of their specialities. Tek Sen restaurant (德盛飯店 – thanks to Foursquare for the translation in Chinese) is pretty mainstream, covered in just about all Penang travel guides and articles, but the food luckily still stands up to its reputation. Although housed in an old George Town building, the restaurant has been renovated from its original shophouse atmosphere into somewhat of an atmosphere that reminded me of an open air garage with round tables scattered about. But I think they actually did a pretty good job of modernizing yet still maintaining the old character of the restaurant. 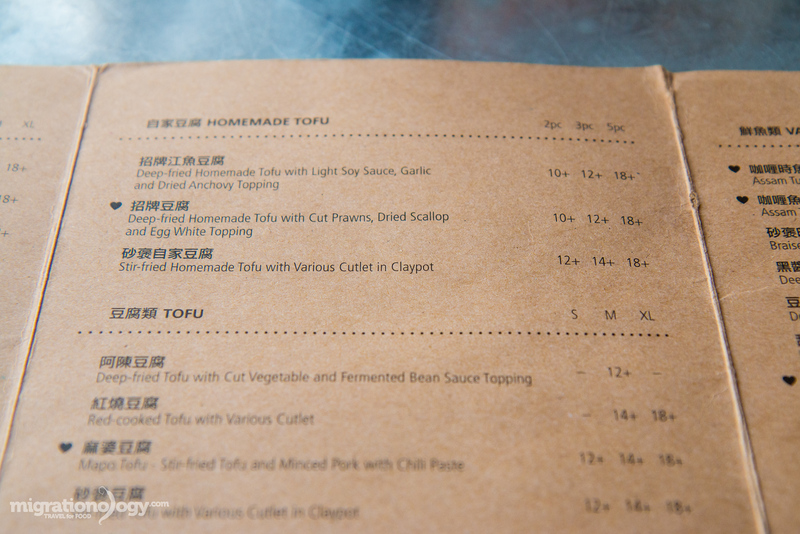 The menu, written in both English and Chinese, was very easy to follow and to choose from. For many of the dishes at Tek Sen you can order a choice of size, which is really nice depending on how many people you come to eat with. We arrived pretty early, in the late afternoon at about 5:30 pm just after they had opened and before the main dinner rush, and we chose a table on the outside sidewalk. Double roasted pork with chili padi – wow! One of their ultimate signature dishes – and looking around the restaurant while we were eating I didn’t see anyone without it – is their home recipe double roasted pork. They had a version of just regular, and one fried with chili padi. Anytime I see a dish with chili included in the name, that’s a no brainer for me. The double roasted pork with chili padi appeared to be bite sized nuggets of pork belly, maybe then deep fried and then stir fried with sauce. I’m just guessing about this. That’s my wife sneaking a bite while I take photos! 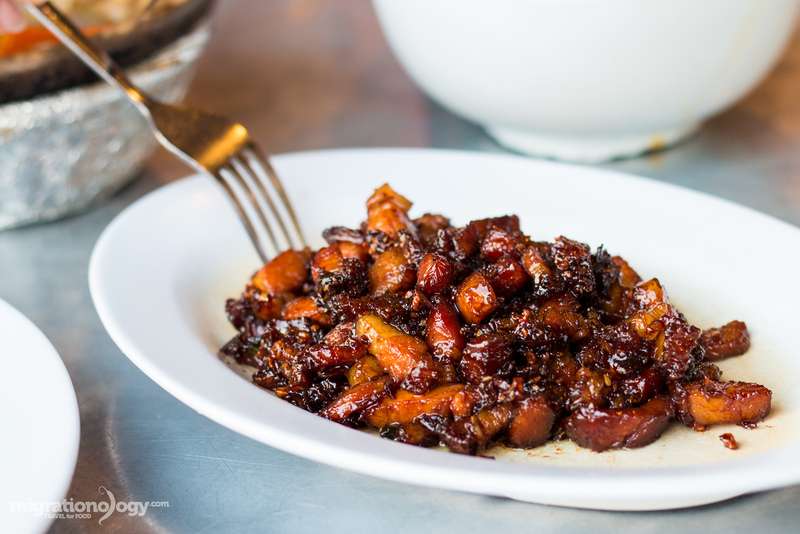 The pork glistened like a honey glaze, and when I took my first spoonful out of the plate, I could literally feel the stickiness of it in spoon. The pork was sweet and salty, with a texture that was half crunchy and half juicy and gooey, and it was extremely rich and greasy. While it was extremely tasty, the double fried pork was too sweet for me – maybe it was because of the chili padi sauce? Still, worth ordering at Tek Sen, and it’s a must if you love pork. 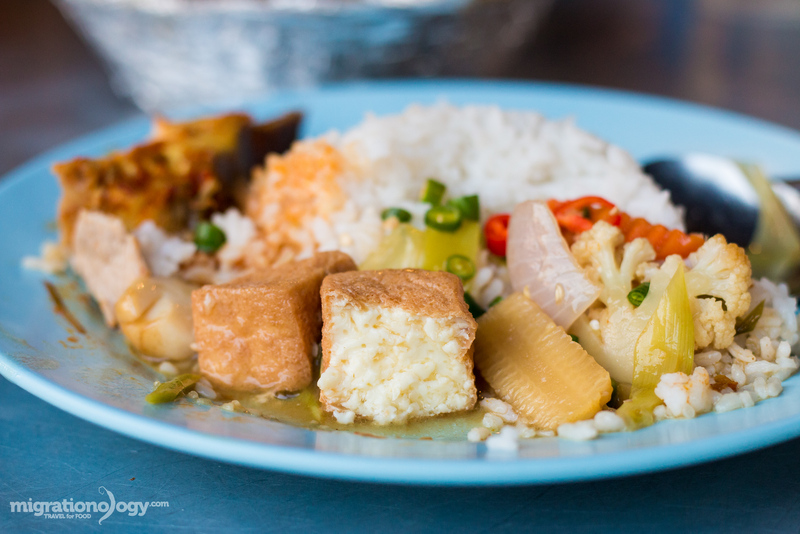 I really love good tofu, and at Tek Sen restaurant another one of their specialities is their home-made tofu. 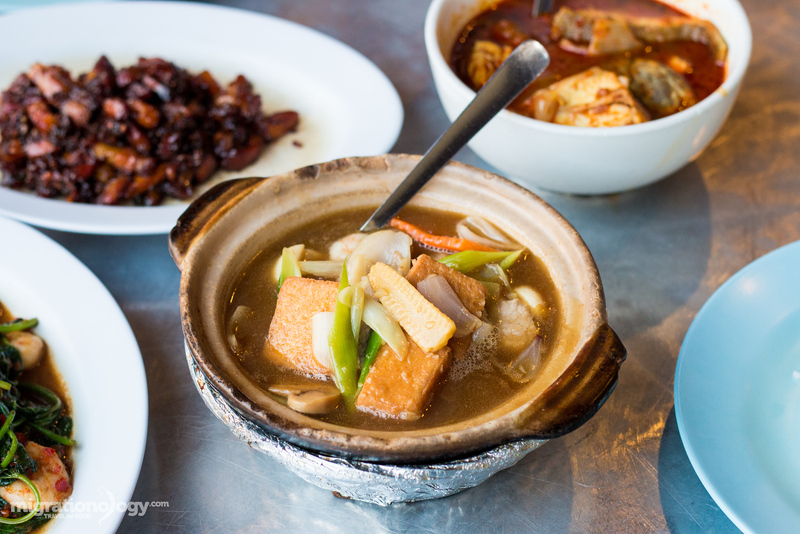 I was torn from all the different choices, and as much as I wanted to try their mapo tofu (one of my favorite dishes in the world), we decided on the tofu braised in a claypot. 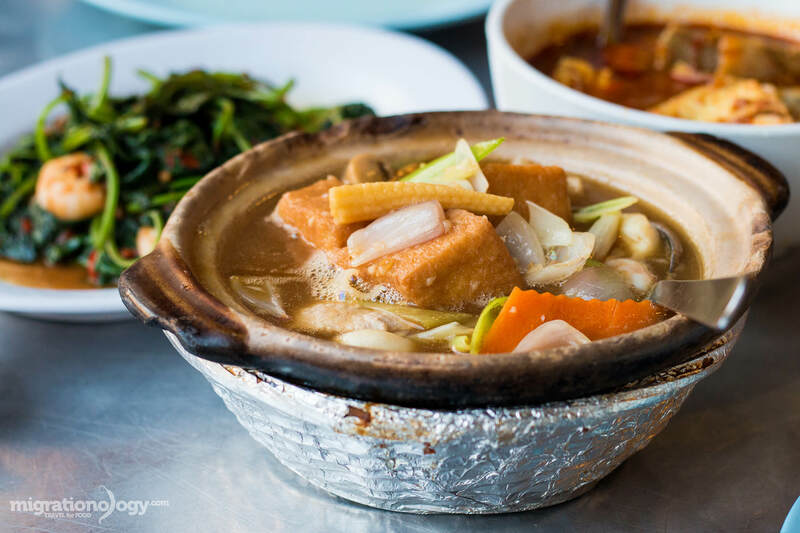 The tofu was first deep fried to give it that golden outer skin, then braised or stewed in a claypot along with an assortment of vegetables, all submerged in a fragrant thickened sauce (kind of like gravy). The pieces of tofu were insanely good, a slightly chew texture on the outer skin, but inside just silky smooth and fall apart tender. The braised gravy was salty with a tiny bit of sweetness, and it had a beautiful sesame oil aroma. 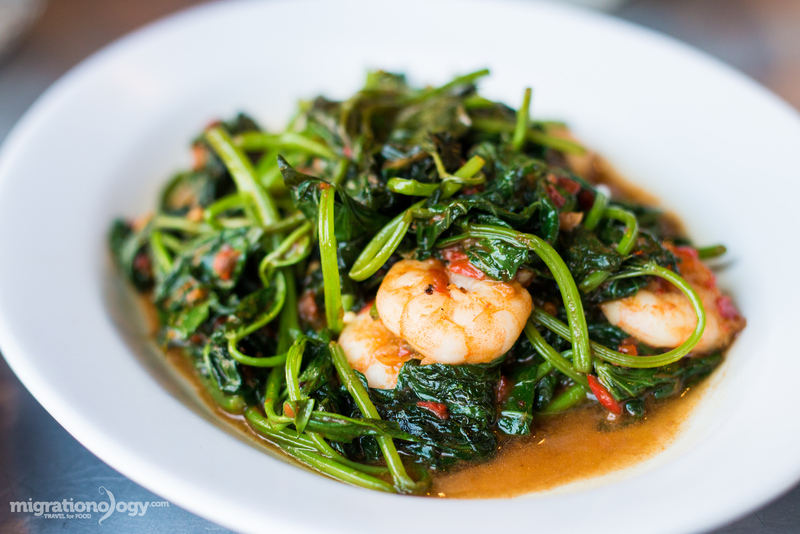 This was probably my favorite dish of our meal at Tek Sen.
For vegetables, to balance out the greasy double fried pork, Ying and I ordered a plate of stir fried potato leaves with sambal (chili sauce) and prawns. The menu just said potato leaves, but I’m guessing they were sweet potato leaves similar to this. The vegetables tasted a lot like spinach, but with a little less of that spinach slimy texture and a little more crisp, flavored with a shrimpy tasting chili sauce and nice prawns mixed in. It was a nice and flavorful vegetables dish – my kind of vegetables. Along with the braised tofu in a claypot, probably my other favorite dish of our meal at Tek Sen restaurant was their version of assam tumis, a Chinese Malay dish which is probably one of my all-time favorites of Peranakan cuisine. You could either order with sting ray or black pomfret, we ordered the latter. 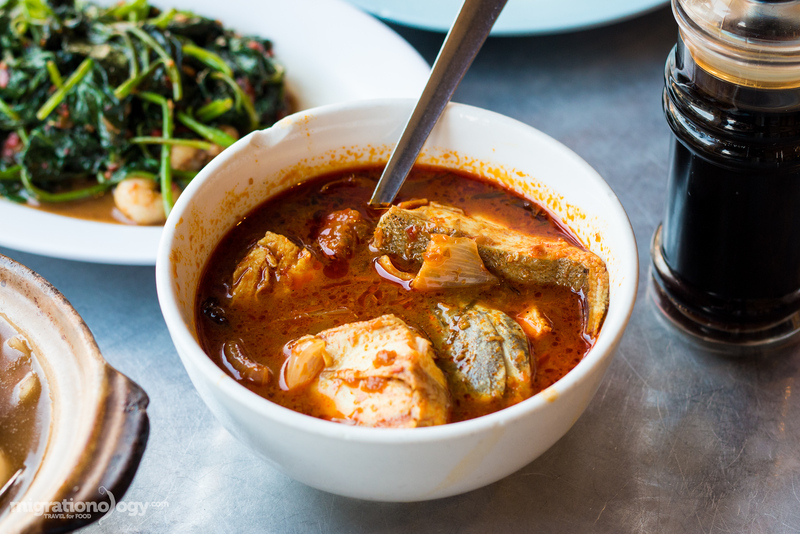 The assam tumis was a beautiful color, dark red and shiny, with pieces of black pomfret sticking out of the soupy curry. 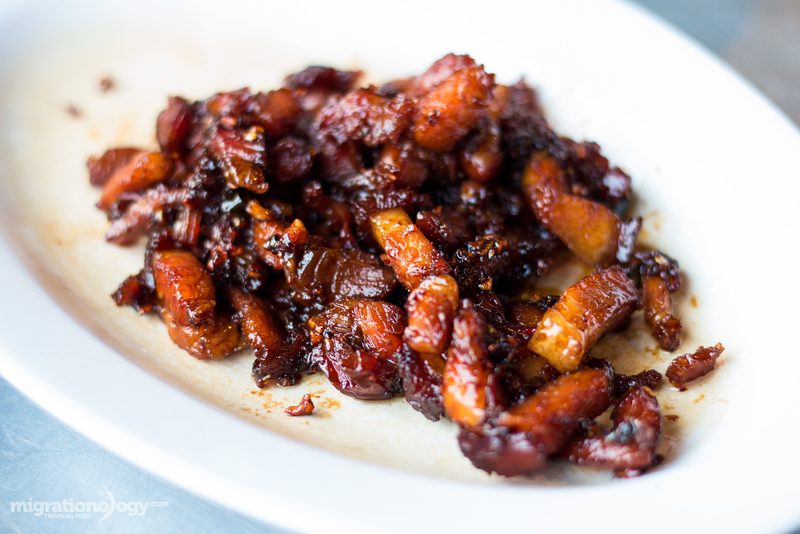 Assam tumis is really a dish that glorifies all tastes and flavors in every bite. It had a wonderful blend of saltiness, spicy, sourness, and a hint of sweetness, with another hint of an herby flavor from what I believe was torch ginger flower. Black pomfret is an excellent fish when it comes to making curry or soup, it really hold up and stays firm. 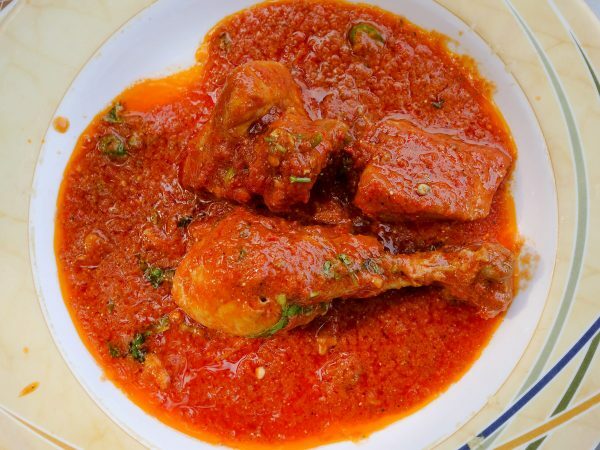 The fish was like soft chicken breast, and it just soaked up the wonderful flavor of the curry. I did have a better version of assam tumis when I was in Penang, which I’ll be sharing soon, but this one was quite excellent as well. 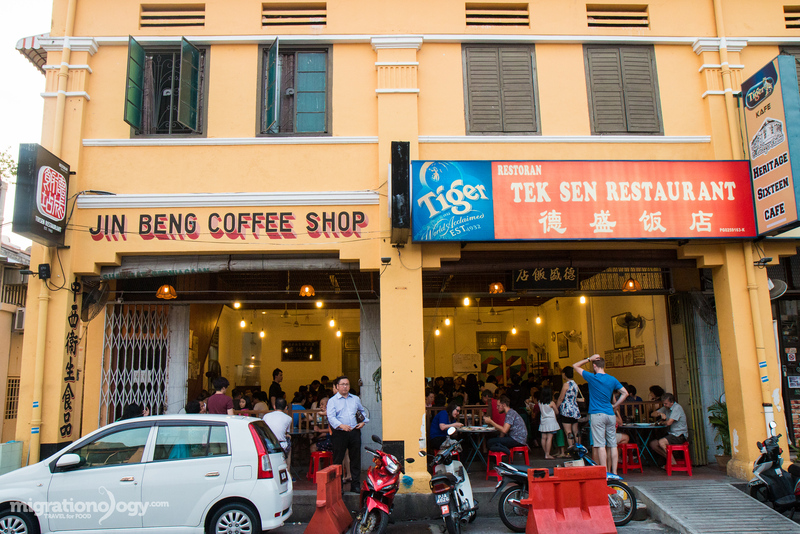 Tek Sen is a famous Chinese restaurant in George Town, Penang, Malaysia, that has been serving delicious food since 1965. 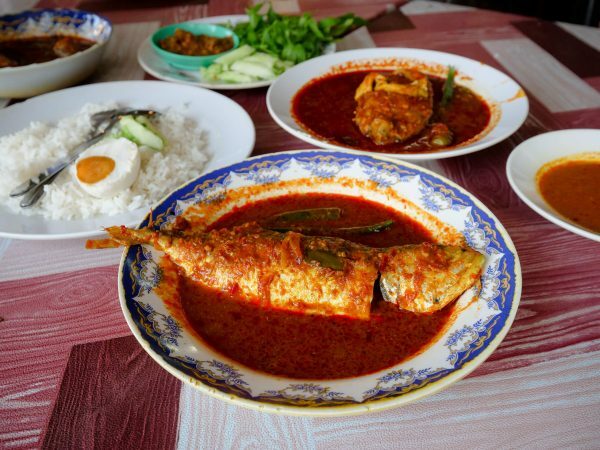 Although they’ve gone through a number of renovations and have become quite a mainstream standard restaurant in Penang, I was happy to find out their food is still top-notch. The double fried pork with chili padi was a little too sweet for me, but it was still pretty tasty. The braised tofu was fantastic, and the other dishes we ordered were all excellent. Tek Sen is clean and convenient, easy to get to in George Town, and both the food and service were very good. Open hours: Monday and Wednesday – Sunday (closed on Tuesday and Saturday) for lunch from 12 Noon – 2:30 pm and for dinner from 5:30 pm – 9:00 pm. I went for dinner and arrived right at 5:30 pm, so I’m not sure how the crowd is at lunch. 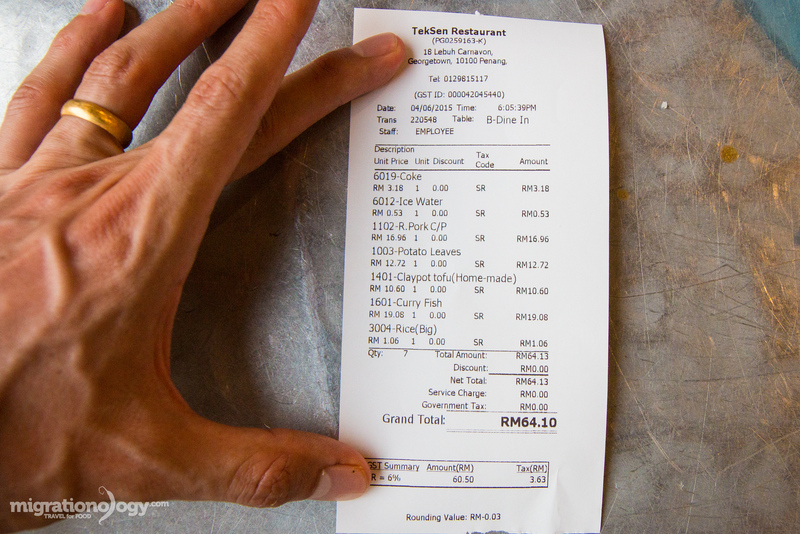 Prices: Our total bill for everything we ordered above, plus rice, and Ying had a soda, came to 64.10 MYR ($17.16) – kind of a mid-range price. Not bad for the quality. is there any ala carte menu? This definitely one of my favourite restaurant in Penang! Guess you know someone local to bring you there! Hi, the coke, ice water and potato leaves are ripoffs. Thank you for sharing Nee, that’s unfortunate. 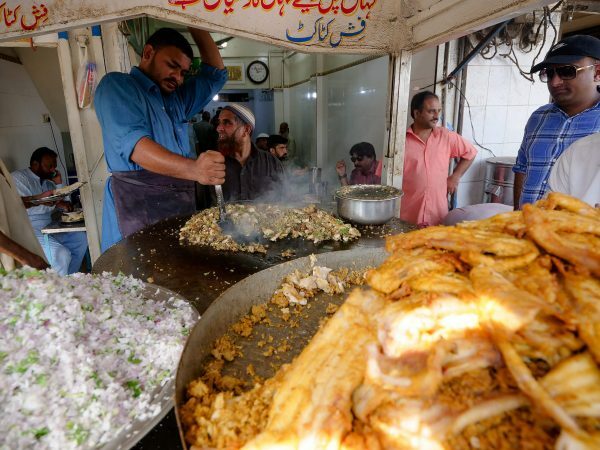 So for locals eating there, would the price be lower for those items, or are they on the menu, but just overpriced? I was thinking whether to eat at Tek Sen and found this post. Canned drinks are usually RM2.50 – RM2.70 in establishment like this (non air cond, local fare) considering they are already earning ~40% more than local hypermarkets. I don’t know why but vegetables are darn expensive when cooked but so dirt cheap in raw in Malaysia, and they are much easier to cook than meat or seafood. You might have noticed they will always implore you to order a plate of vege, because of the profit. The vege are usually charged between RM8-RM10 for a small helping like yours. Ok cool, thanks for explaining Nee, that’s helpful! In a good word, I am anti-profiteering. In a bad word, I am cheapskate. Great recommendations with tempting pictures! My in-laws live in Perak (very near Penang).and your blog just gave me lots of inspiration to travel there the next round I visit them! Thanks for the wonderful tips. I’m curious to know if you are you still travelling around Asia or are you stationed in Thailand and doing blogging for a living? Glad to cross paths and hope to learn something from you. Great to hear from you, thanks for the comment, and that’s awesome that your in-laws are in Perak. I’m based along with my wife in Thailand, but we travel quite frequently. Yes, my wife and I together blog and make videos full time. Oh yum! I’m headed to Penang at the end of the month, and seeing this post got me even more excited! Adding Tek Sen to my long list pof restaurants to visit! Great to hear that Nina, enjoy Tek Sen! Hey Steph, cool, glad you like restaurant. Thank you for the suggestion, next time I’m going for the soy milk and and mapo tofu – I’m regretting I didn’t order it! I love your blogs, your books, your suggestions! Then there are the videos that show what you have just read. 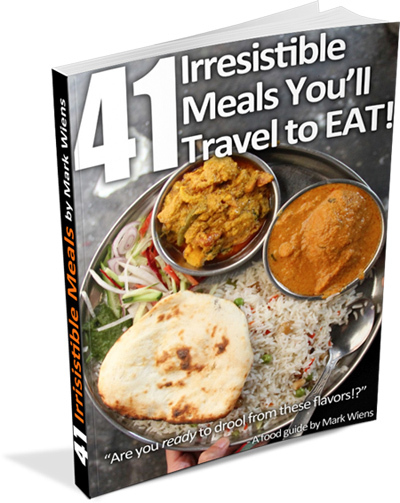 I have shared your info with a few people for food from places we were going to/had visited. But some of them entice me to go to places I have not planned to visit, so my bucket list is ever-changing!!! And I will share it with more friends via email and FB. I really like the way your blog reads then leads to the video. Keep up the great work and I will keep subscribing. Hey Bonnie, I really appreciate your kinds words, and for following and sharing, thank you. Where are you planning your next trip? Morocco. Do you have any tips??? Hi Chintan, thank you for letting me know. Sorry about that, sometimes my filter picks things up that it’s not supposed to. I appreciate you sharing your thoughts. Hi Bonnie, unfortunately I’ve never been there. Are you planning to go?